We left Leverick Bay after spending some time jockying for position at the fuel dock. It seems that there are many other boats with the same plan... load up with free water and set sail early to Anegada. We had friends from BYC here for their first visit who really wanted to follow us there, but we hadn't been able to make contact. It worked out though... with all of the boats making tracks in the same direction, it would be hard to miss the entrance. We took a mooring after an easy entrance into the mooring field despite the high winds. They were responsible for the murky waters that kept us from being able to see the reef bottom literally 2 feet from our keel in spots. It's much less nerve wracking if you can't see it. What you can't see, can't hurt you... right? We took the dink to shore after radio-ing in for dinner reservations at the Anegada Reef Hotel. We got an open air taxi to take us over to the other side of this long low island to Loblolly Bay for some snorkeling. while Phil and Jackie did some snorkeling. Next, it was our turn to go out. There is a vast expanse of shallow water to explore here inside the protection of a reef ringing the beach. I checked out the lobsters in the trap. They didn't look too worried to me. Just a bit grumpy! Bruce picked up a pretty shell off of the bottom for me to take home but we found it occupado. Oh well, he needed it more than I did anyway. I was travelling light this trip. We came upon a turtle hanging around snacking on things I couldn't see. He had some kind of tag on his right forward fin and what looked like a fishing lure on his left. He swam around for quite a while without taking any notice of me following him along. The visibility was pretty good. I don't think Phil and Jackie got out very far. They should have though, it was fun out there near the edge of the reef. We took a walk along the crescent beach to dry out and warm up after snorkeling. It is so beautiful here. You really can't tell it from the pictures, but the sand here at Loblolly Bay is made largely of ground pink coral. It has the faintest pink hue. We had some time to kill so Bruce brought me out a pina Colada. Now that's living! Why aren't there cool places like this back home? 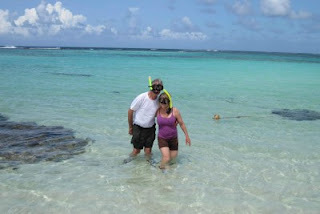 We left Loblolly to take our taxi back to the Anegada Reef Hotel where we were moored. Then they kill them and cut off their spines. They let us hold these two big boys for a bit. We went back to the boat to shower and rest for a while until our dinner reservation time. We came back ashore and found that we had been given the primo table!! Woo wooo! We had finally arrived! Unfortunately, before we even had our dinner served, a pretty good rain shower came over and they moved everyone on the beach back in under the cover. This crammed us all close together and we lost our primo view. Oh well, the food was still fabulous. Hey, anyone know a recipe for ratatouille? We had the obligatory cat at our feet snatching up bits of lobster that I passed to her. You've gotta love a place with cats under the tables.